‘The Casketeers’ is a surprisingly life-affirming reality show about death | Daily Review: Film, stage and music reviews, interviews and more. Reality shows usually get a bad rap, responsible as they are for the careers of product-shilling Instagram influencers and even one megalomaniac president. They’re thought to bring out the worst in people, and satisfy the devilish pleasure we get from watching others embarrass themselves. But some reality shows elevate this much-maligned genre, offering windows into the lives and personalities of seemingly ordinary people whose stories we might have otherwise overlooked. That’s part of what makes New Zealand’s The Casketeers, which debuted recently on Australian Netflix, so compelling. 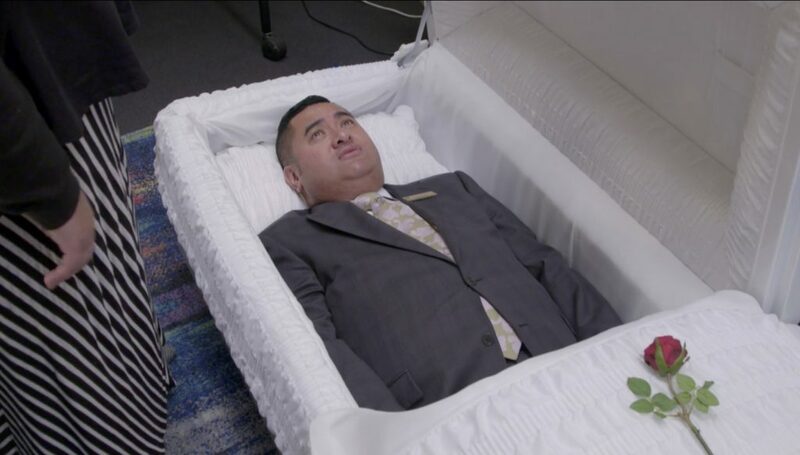 Millions of people around the world can now spend six episodes of television with a playful-but-dedicated group of Kiwi funeral home directors. In spite of its dark subject matter, this is a reality show that will make you feel better, not worse, about humanity. The Casketeers follows the working lives of the people behind Tipene Funerals, a Maori-run funeral home in the Auckland suburb of Onehunga. Francis Tipene and his wife, Kaiora, are the warm-hearted owners, presiding over staff who embalm bodies, transport coffins and lead funeral services. It’s an unexpected premise for reality TV, and it plays like an oddball Kiwi comedy you might expect from the country that brought us Flight of the Conchords and Taika Waititi. The humour is so clever and so dry – and some of the shots so beautifully framed – I had to double-check it was a reality show and not something scripted. There are a few goofy bits that seem purposefully heightened for the cameras, like Francis inviting his personal trainer to the funeral home, or the hunt for the employee stealing biscuits reserved for grieving families. But the morbid silliness is interspersed with touching depictions of how delicately and deliberately Francis and his colleagues care for the bodies of the deceased – as well as the feelings of their families. In one scene, Francis leans over the body of a young mother, who had died of a gunshot wound, to perfect her hair with a flat iron. Director Susan Leonard has a knack for capturing small moments that are quietly affecting, such as a row of fingertips gently brushing the doors of a passing hearse, or a man who lays his arms one last time over a casket about to be cremated. Other scenes will bring tears to your eyes. In one, Francis and a colleague, Fiona, stand out in the rain, singing over the tiny casket of a baby. The star of the show, however, is undoubtedly Francis, a loveable busybody who spends money a bit too freely, much to the consternation of his wife, and who is fastidious about the presentation of the dead. Almost everyone featured in The Casketeers is of Polynesian heritage, including Maori, Samoan or Tongan, and it’s a nice look at the varied ways people from different cultures and families remember their loved ones – through song, dance, the haka, little mementos or carefully chosen caskets. One sea-loving man, buried in an azure-coloured casket with rope handles, prompted me to think about my own coffin preferences. The result of all these little moments is a poignant, funny and often revelatory look at the inevitability of death, and what we can learn from the people so intimately connected with it. The Casketeers are kooky, sure, but they are caring and calm in a way that can only come from experience. To them, the funeral business is not a gloomy profession, but a worthy one that honours the dead and nurtures the people left behind. “It’s all worth it, because I’m proud to be a Maori, and also a funeral director working for our people,” Francis says. The juxtaposition of comedy and tragedy can feel a bit jarring, especially without ad breaks. The third episode swings from the melancholy scenes of a funeral to Francis approaching a man about trying out his fancy leaf blower. But it’s that uncomfortable clash between heartbreak and humour, light and dark, that makes The Casketeers feel so true to life. Series one of The Casketeers is now on Netflix. The second series debuted January 14 on TVNZ 1.